The kitchen pantry is supposed to be a place to keep the clutter at bay. It is supposed to be clutter-free. Ironically, no matter how big your pantry is, you will always find it hard to root around for the flour. It takes like the whole day to find it, doesn’t it? If your snacks, cereals, flour, and condiments begin to be all jumbled up in the pantry, take a look at these 10 pantry storage and organization ideas that will save your day. Have you ever wondered why your spacious storage always ends up as a jumbled mess? You keep cramming the cereal bags although your pantry still has plenty of space. It is because you only use the horizontal storage, not the vertical one. Optimize the available space and store more things with under-shelf baskets. These baskets can be suspended from the upper shelf, so you can go vertical. They allow you to have more space to store different types of ingredients. Therefore, you will not need to unload the whole shelf just to find a bag of corn kernels. Empty containers can really gobble up a lot of space. Even a shelf can only host 4 to 5 containers if you store them by stacking them up along with the lids on them. Then, what about the remaining empty containers you have? To save lots of space in your pantry, you can try storing the containers in a different way. You need to separate the containers from the lids. It will enable you to stack up more containers on the same shelf. Then, you can store the lids on the different shelf. You can either stack up the lids or use a CD holder to keep them tidy. You can also make your own lid rack from boards and dowels. To make your pantry look more organized, you might need some containers to sort them all based on their categories. However, being well-organized is not enough. You will also need to make it look visually appealing. You can try to add a visual appeal by color coordinate the containers. This pantry features green and blue baskets that have made it look more attractive and organized. Sticking to 2 or 3 color hues will be better than mixing up a wide array of color hues which can make a haphazard look. Sorting the stuff in your pantry is the organizing 101. By sorting them all, you will save a lot of time as you can find anything you want more easily. Place all the stuff that belongs to a certain category in the same basket. Then, you can a label on the basket that helps you know where to go if you want to find a bag of potato chips. Do you know what can make your pantry look unorganized and lack storage space? It is the cardboard boxes. Oftentimes a cardboard box has a bigger size than what is inside it. Therefore, that bulky box needs to be torn off to cut down on the excess. Instead of putting snacks or cereals along with their boxes in a row on a shelf, try storing them in clear jars or plastic containers and throw the boxes to the dust bin. This will allow you to have extra space and enrich the textural element in your pantry. Sometimes you need to put salt, pepper, and other condiments on the counter-top rather than keeping them in your pantry. They are the mostly-used ingredients that you need in almost every dish. Therefore, they have to be within your reach when you are cooking. Unfortunately, tossing them on the counter top will just take up the counter space and ruin the look of your kitchen. You can try storing them in wire racks that are hung over the counter top. To make these smart racks, you will need to install a curtain rod about 20 inches off the countertop. Then, add some S hooks that will keep the racks in place. And, that’s all. Your house is like a treasure island. There lie many kinds of potential things that you can use for the sake of home improvement. One of which is wood pallet. 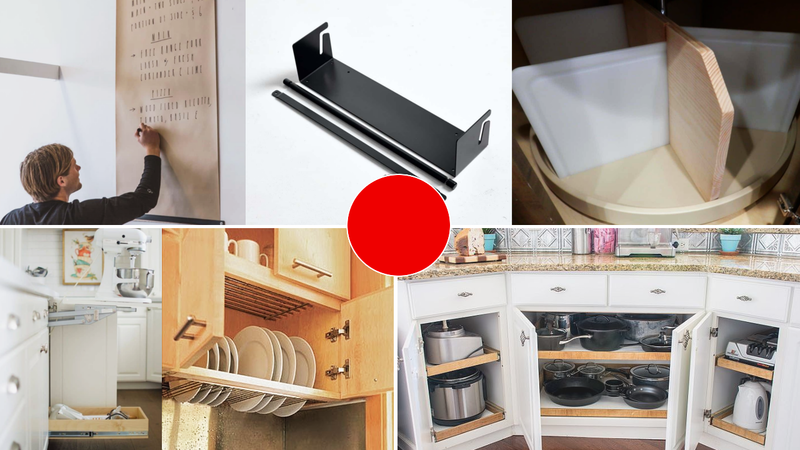 It can transform into almost anything including a multipurpose rack for your pantry. You only need to get a wood pallet, stain or paint it as you like, add a few rods and S hooks, then you can hang your pots and cups. Putting on a label on each jar is a common way to get acquainted with ingredients in your pantry. Besides, it is also crucial since it can prevent you from adding salt to your tea or flour to your soup. You may have come across a lot of ideas about putting on labels. But this idea will add a nuance to your pantry. These printable labels look like the definition of each condiment based on what you can find in a dictionary. They add a little bit of knowledge like how to pronounce them correctly and what they are made of to anyone who see them. Chalkboard is very versatile. Therefore, you need to harness the versatility of it by incorporating it into your pantry door. The chalkboard doors can act as a reminder of what is running out in your pantry and needs to be included in what-to-buy list. It can also be a great reminder of what you are gonna cook for a week. You won’t need to spend more time just to think about what you’re gonna cook for today because everything has been planned and listed on your pantry door. The most hectic thing is when you have to unload some jars or plastic containers only to find brown sugar. Try storing things in some jars with different sizes. Place the taller jars at the second row while the shorter ones at the first row. Or, you can invest in some spice racks with step shelf that allow you to store the jars at the different height. So, Those are 10 pantry storage and organization ideas that worth copying. They will not only keep your pantry organized but also make it look more attractive. 333 Small Kitchen ideas include Organizations. 13 DIY Projects to better Optimize your Kitchen Space. 12 Unique Kitchen DIY Organization Ideas.